The Revolver 42 from Italy hits a high-performance bull’s-eye in the US. 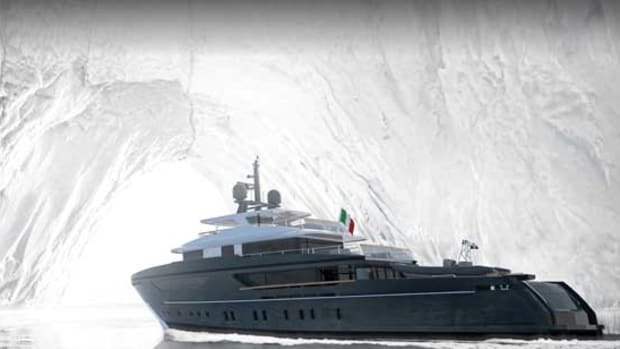 Italian businessman Carmelo Zocco had plans for a new performance cruiser steeped in his homeland’s style-focused culture. 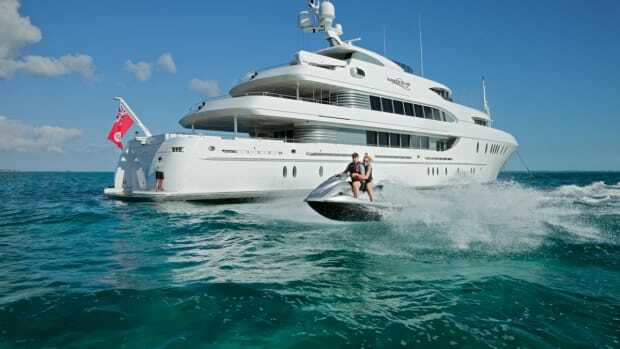 He called on Sarasota, Florida’s Michael Peters Yacht Design and asked succinctly for “balance between elegance and aggression—a boat that was dynamic, functional and unique.” Five years later, in 2011, the Revolver 42 made its debut at the Monaco Yacht Show. This year, in conjunction with the Miami International Boat Show, the Revolver 42 came to the U.S. for the first time to entice the American performance crowd with its sleek lines and design. At the Florida Powerboat Club’s annual run to Islamorada after the show, the sheen of the deep olive-green, metallic hull made a statement at the docks, showing off the Revolver 42’s stylish features to the performance enthusiast market. 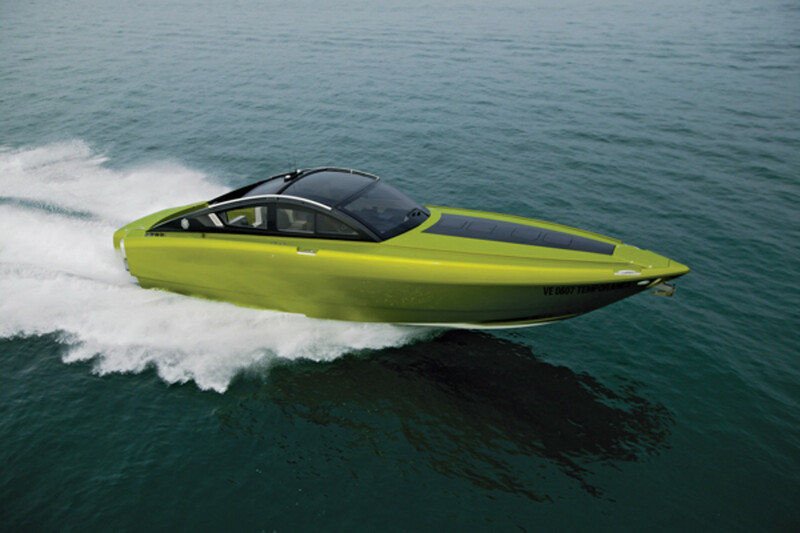 As the U.S. performance buyer trends away from traditional powerboats to center consoles, the Revolver may be on target with its American aspirations. Zocco believed that in the past decade, not much had changed in the styling of traditional powerboats, so as a boat, car and plane enthusiast, he sought to create a new and more exciting vessel style. His friend, Phil Rolla, the renowned propeller designer, made the referral to Peters, who understood the Italian priorities and had the expertise to make them reality. The Revolver 42 sports definitive automotive influences, evidenced by its closed cockpit, aerodynamic windshield and sloping lines. Zocco compares it to a sports car rather than a sport bike, since passengers can enjoy a go-fast ride without the disheveling effects of full wind-in-your-face action. The open-air ambiance is maintained by a retractable roof and side windows. 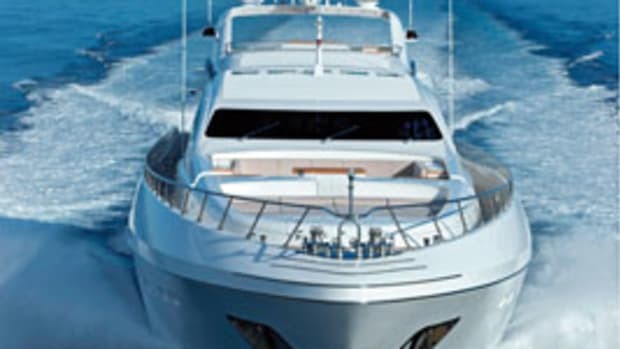 As the aft section of the boat opens to access a large sun pad, the deck also extends to reveal a teak swim platform and ladder inviting direct interaction with the water—priorities for boaters from all nations. 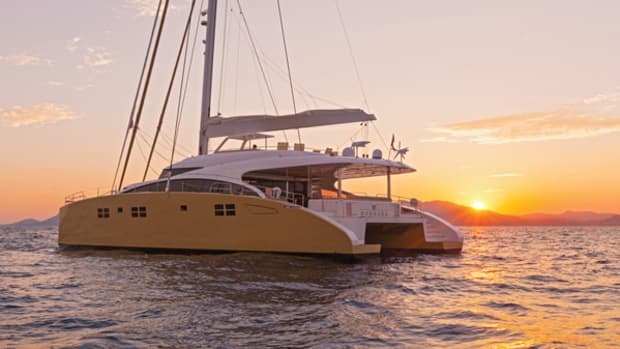 The 42-foot (12.8-meter) length and 11-foot (3.35-meter) beam accommodate a sizable walkaround cabin with a teak sole extending through the padded berth, which can shed the center cushions, raise electrically and become a table with seating. LED light poles raise like circular cleats at either side of the berth and provide modern and color-changing mood lighting. The mini-galley’s Miele stovetop and microwave make snacking or cooking possible, while a bar sink and three drawer freezers/coolers ensure that plenty of libations and provisions can be stowed behind clean, white Corian cabinetry. 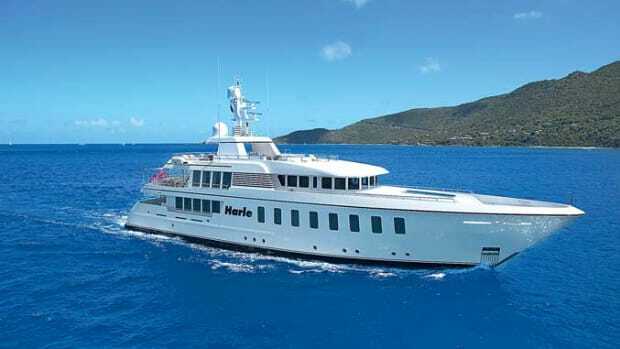 Numerous drawers are conveniently located throughout, carbon-fiber shelves have built-in grab handles for added passenger safety while at sea and a stand-up head and shower beneath the helm has a discreet skylight for natural illumination while maintaining privacy. 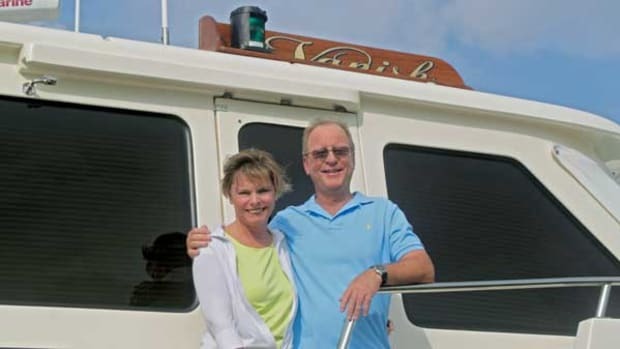 An MB Quart stereo system provides entertainment, while a Condaria air-conditioning system with cleverly hidden vents along the gunwale adds comfort for a dozen or more passengers. 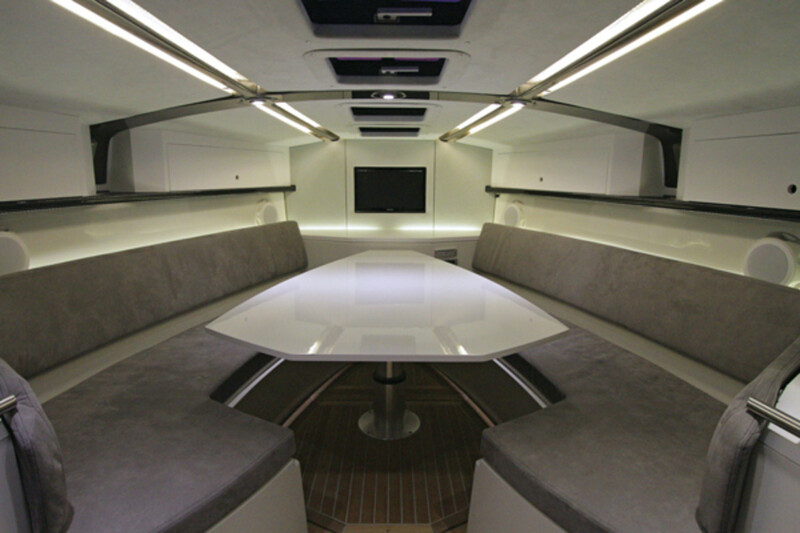 The entire cabin is upholstered in soft and supple Alcantara (white ceiling and gray seating). 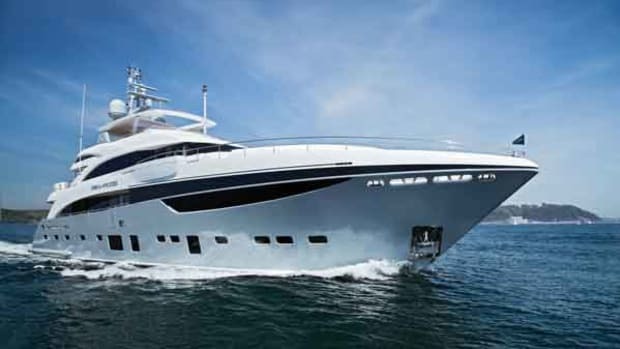 The aft section of the boat has a Lamborghini-esque look, as the hull tapers to rear exhaust vents that look much like tail lights—especially when the swim platform is retracted and the roof closed. 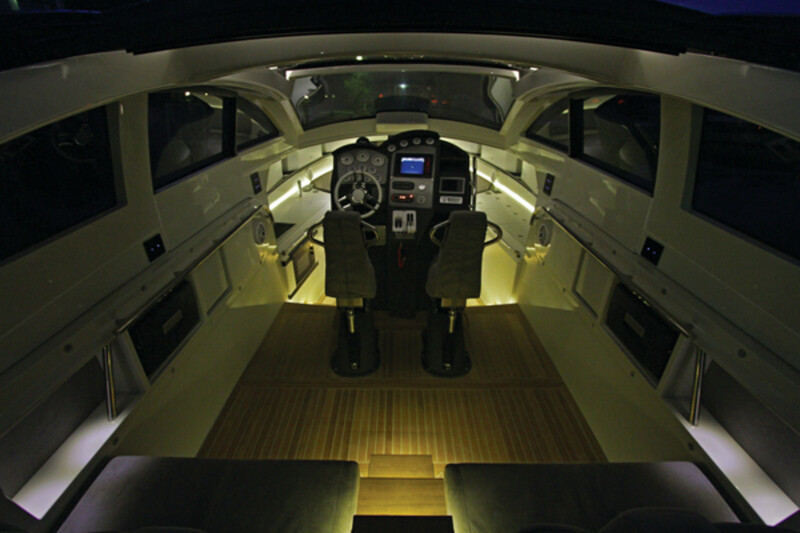 Given all the high technology in today’s performance boats and yachts, the carbon-fiber cockpit dash is equipped with Simrad navigation, Gaffrig throttles, Mercury Racing gauges and VesselView and SmartCraft screens. The “Numero Uno” inscribed on the dash reminds us that it is the first model, so various instrumentation and controls modifications can be made in the future. The second hull is in process and Revolver plans a new model to be introduced for the upcoming Fort Lauderdale International Boat Show, possibly to be constructed in the U.S.
Powered by twin Mercury Racing EU662 SCi (Supercharger Integrated) engines, the highest horsepower marine sterndrive engines certified for sale in the EU, the twin-step V-hull packs plenty of horsepower and, despite its size, is light enough with fiberglass, Kevlar and carbon-fiber construction to boast some impressive speeds. Though it came to the U.S. with Rolla propellers, international racing world champion John Tomlinson of Miami’s TNT Custom Marine was engaged to do some tweaking on the drives and props. 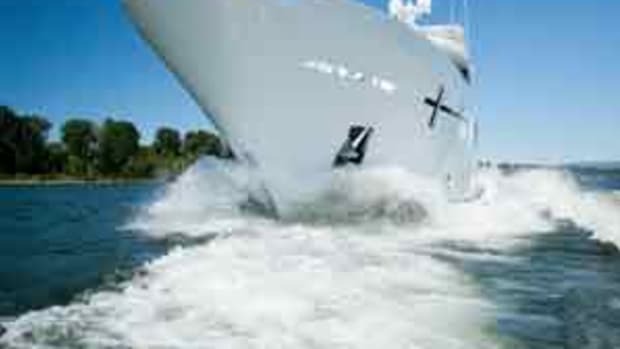 With a pair of Hering 5-blade props (18.25-inch diameter, 26-inch range), he coaxed the boat to 64 knots. 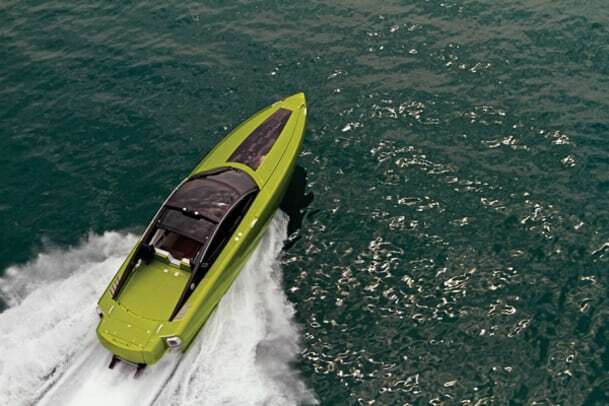 The company believes the next boat can be made even lighter to marginally increase speeds. Seating for the 42 was experimental and will be changed in the next build. Revolver installed Swedish-manufactured, shock-mitigating seats, and while providing a strangely smooth ride, the military look and feel do not quite suit the boat’s luxury styling. The bench seating in the rear may also be replaced by more automotive or traditional marine upholstery, but those are the “easy, bolt-on things,” says Peters. The challenges were achieving speed and spaciousness in a stand-up, enclosed cockpit while adding components such as the retractable roof, which Zocco’s felt would achieve the “classic proportions, soft shape and aggressive details” desired. The boat was built by a group of sub-contractors who had worked with the legendary Fabio Buzzi, had also built sailboats and were familiar with carbon-fiber and Kevlar technology. 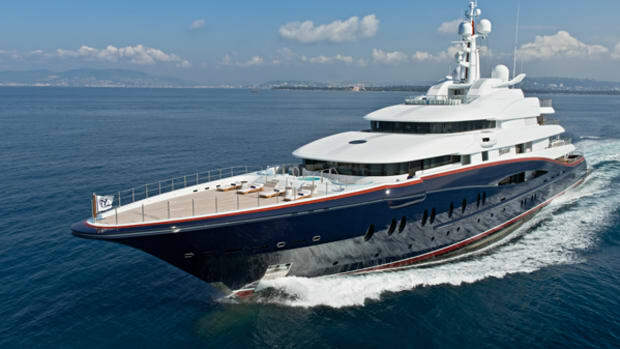 The roof was engineered in Italy by a firm that had done similar work with larger European express yachts. The hull design was largely inspired by a 1998 Michael Peters boat, Alpha Z. Peters was able to utilize some design aspects of that sleek, wooden boat, combined with his racing and yacht expertise, to create this hybrid design of go-fast and go-stylish.